Who said that beavers can't fly? Join the mad inventor Justin on a crazy jumping journey! Use the sling and try to shoot him as far into the sky as you can! Grab coins and collect his whacky inventions like magnets, rockets and balloons. Make sure to avoid the obstacles and failed experiments though as they will stop his flight and make him crash. Upgrade the items to jump even higher and try to earn as many points as possible! 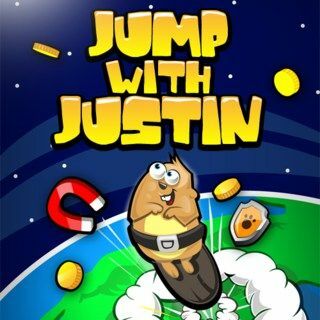 Jump With Justin - Find Jump With Justin in our vast HTML5 games catalogue. Only the best and newest HTML5 games for all audiences. Guaranteed success with Famobi.